Q1. 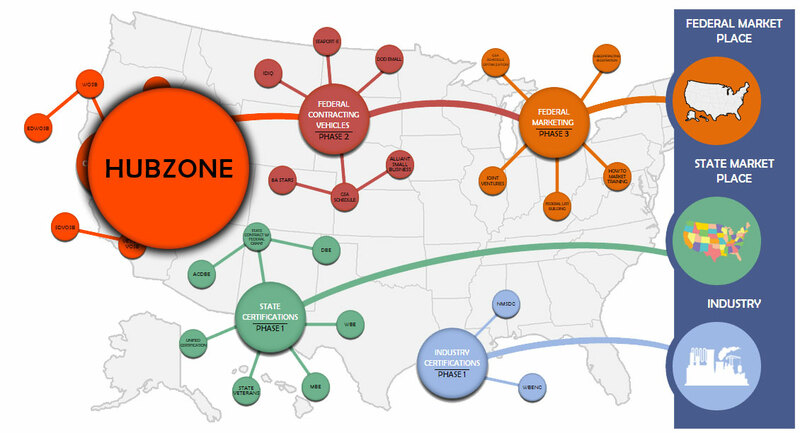 Is your firm’s principal office located within in a qualified HUBZone Tract? If you are unsure check the following location http://map.sba.gov/hubzone/maps/ Definition of a firm’s principal office: A Business location where the greatest number of employees work on a daily basis. The firm’s headquarters can be a different location than principal location. If the firms principle office is located in a HUBZone than the firm is qualified for HUBZone based upon location. (Certain rule changes apply for Construction and other Service Industries). Q1. Does the firm have at least one employee, an owner can be a HUBZone employee even if they are not drawing a salary as long as the owner is dedicating more than 40 hours per month to the firm. Q2. Do at least 35% of your businesses employees reside within a HUBZone. The SBA will not round up for example 34.5% would be below this requirement. The evidence the SBA will require will be payroll records for the date of the application with employee State Identification as evidence of that employee residing within the HUBZone. Employee – An individual employed on a full-time, part-time, or other basis, so long as that individual works a minimum of 40 hours per month. This includes employees obtained from a temporary employee agency, leasing concern, or through a union agreement or co-employed pursuant to a professional employer organization agreement. Owner – A person with an ownership interest in and works for the HUBZone Small Business Concern a minimum of 40 hours per month, that owner is considered an employee regardless of whether or not the individual receives compensation. Volunteers (i.e., individuals who receive deferred compensation or no compensation, including no in-kind compensation, for work performed) are not considered employees. Q1. Does the business have any affiliation, meaning another business concern can elicit control over the firm? Your company may become affiliated with another firm if some or all of the conditions are met. This can be problematic for a firm seeking HUBZone certification because in many cases it will result in the principal office or greater than 35% of the combined and affiliated firm’s employees to not reside within a HUBZone. If the person owning more than 51% of the stock of a HUBZone firm also owns the majority of another firm the two companies are affiliated and must be combined for purposes of HUBZone. If a person does not own the majority of two companies but owns the largest portion or equal to the largest portion of another shareholder the two firms are affiliated and must be combined for purposes of HUBZone. If there are any options or convertible agreements then the SBA views these agreements as having been fully exercised. If this leads to the two entities being affiliated then the conditions for both firms must meet the criteria for HUBZone. If two firms have identical or nearly identical management and are in the same industry or nearly the same industry than the firms will be affiliated for purposes of HUBZone. If family close family members own firms that are in the same industry the two firms will be affiliated for the purpose of HUBZone. If one firm accounts for a significant piece of another firms revenue through a subcontractor relationship the SBA can affiliate the two entities for purpose of HUBZone. If another company provides significant loans to another company and the HUBZone applicant firm has over reliance on this financial support the SBA can affiliate the two entities due to control issues. This can also occur when loans from one business to another are not deemed to be an arm’s length transaction. One firm is dependent upon another firm based upon a patent, or license in order to operate, then the SBA will affiliate the two entities. Q1. Is the ownership of the HUBZone business at least 51% owned by one or more US Citizen? All the 5 areas must be passed in order to be fully eligible for 8a certification. Call 859-442-3300 if you have questions or issues, we can discuss.